"This isn't the land of backup, Jane, this is the land of 'you're on your own.'" The Weinstein Company has debuted a second trailer for the indie thriller Wind River, the feature directorial debut of screenwriter Taylor Sheridan (of Sicario and Hell or High Water previously). This film is a "snow-noir" thriller about a murder mystery set in the snowy mountains of Wyoming, mostly around an Indian Reservation where the locals clash with the government authorities. Jeremy Renner stars, with Elizabeth Olsen as a FBI agent sent to investigate. The cast includes Jon Bernthal, Martin Sensmeier, Julia Jones, Kelsey Asbille, Graham Greene, and Gil Birmingham. This excellent film has been playing at film festivals all over the world, from Sundance to Cannes to Sydney to Seattle (here's my review). I saw it for a second time at the Karlovy Vary Film Festival, and it's still as good as it was the first time around. Add this to your watch list. You can still watch the first official trailer for Wind River here, to see more footage from this film. US Fish & Wildlife Service agent Cory Lambert (Renner) discovers a body in the rugged wilderness of the Wind River Indian Reservation. The FBI sends in rookie agent Jane Banner (Olsen), but she's unprepared for the difficulties created by the oppressive weather and isolation of the Wyoming winter. When she employs Cory as a tracker, the two venture deep into a world ravaged by violence and the elements. 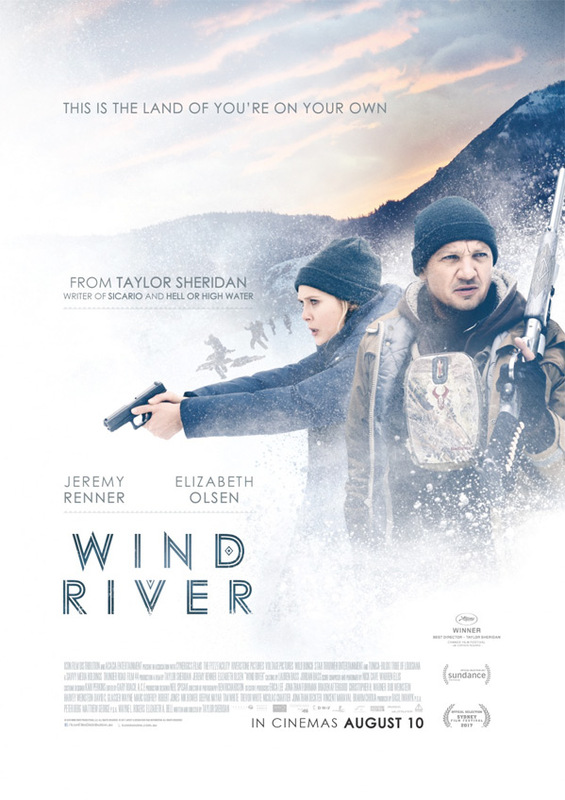 Wind River is written and directed by Oscar-nominated American screenwriter/filmmaker Taylor Sheridan, making his feature directorial debut after writing the scripts for Sicario and Hell or High Water previously. This first premiered at the Sundance Film Festival (our review), and also played at the Cannes Film Festival this summer. The Weinstein Company will open Wind River in select theaters starting August 4th. You in?